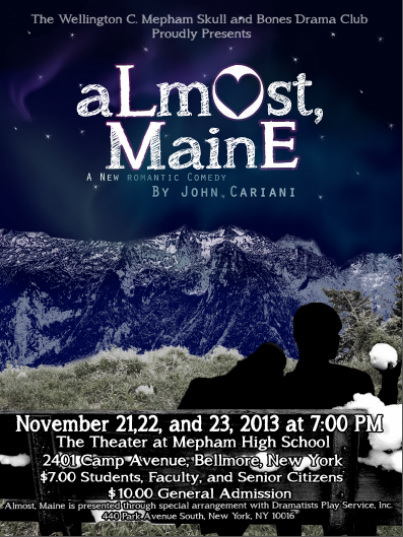 On a cold, clear, moonless night in the middle of winter, all is not quite what it seems in the remote, mythical town of Almost, Maine. As the northern lights hover in the star-filled sky above, Almost's residents find themselves falling in and out of love in unexpected and often hilarious ways. Knees are bruised. Hearts are broken. But the bruises heal, and the hearts mend--almost—in this delightful midwinter night's dream. "…a whimsical approach to the joys and perils of romance. Magical happenings bloom beneath the snowdrifts." —NY Times. "A charmer…Unexpected magic lingers in the air like someone's breath on a cold winter's night. John Cariani aims for the heart by way of the funny bone." —Star-Ledger. "A snowy charmer…These nine tales of love in the time of frostbite have a winning glow that proves surprisingly contagious." —NY Sun. The above text is borrowed from Dramatists Play Service, Inc.
Curtain rises promptly at 7:00 PM for all performances. Sabrina Niedfeld, Edward Grosskreuz, Jr.
Anthony Clemente, Sean Lotz, Edward Grosskreuz, Jr.